Wisconsin Lakes pepper is an early-maturing, bell pepper that turns from green to red. The sweet fruits have thick walls and weigh about 4-6 oz. 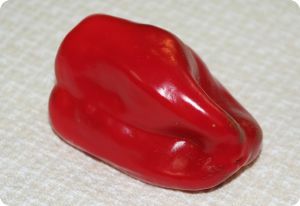 Pepper 'Wisconsin Lakes' is a reliable variety for Northern gardeners because it ripens early and has good production. Start pepper seeds indoors 6-8 weeks before the last frost date. Sow 1/4" deep. Transplant outside 2 weeks after the last frost date. Full sun. Spacing 15".